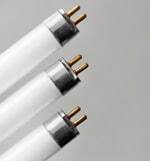 Myth: Leaving fluorescent lights on is more efficient than turning them off. Though there is a surge of energy use when a fluorescent lamp is first turned on, it only lasts for about 1/10 of a second and is equivalent to about 5 seconds of normal operation. The amount of energy consumed by leaving a light on is far greater than the initial spike in energy consumption required to power a fluorescent lamp. To help save energy, turn your lights off if you’ll be out of the room. Installing occupancy sensors can automatically turn off the lights in a room that has been unoccupied for a specified amount of time.